I managed to fast on Monday and Thursday this week, which is my ideal spacing of the 2 low days. 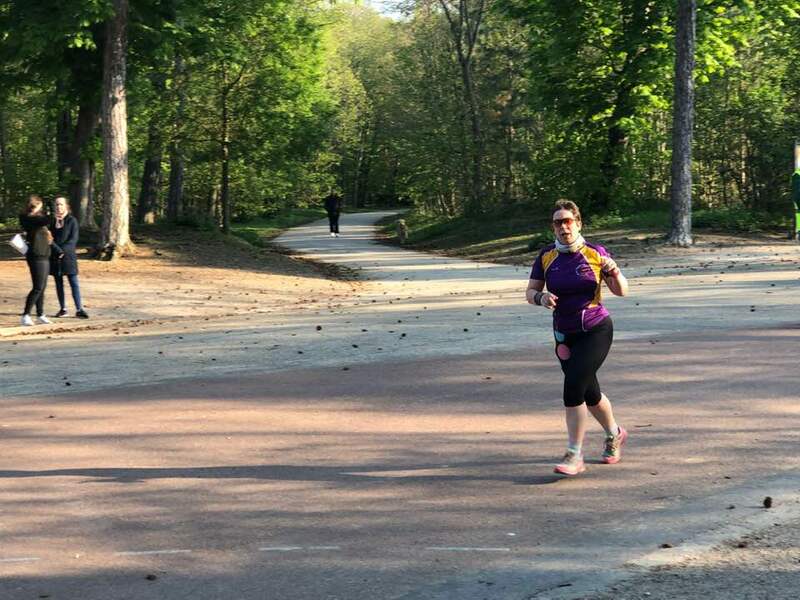 On Monday I had Scottish Dancing in the evening – having something to go to which requires me to drive is a great way to take my mind off fasting. 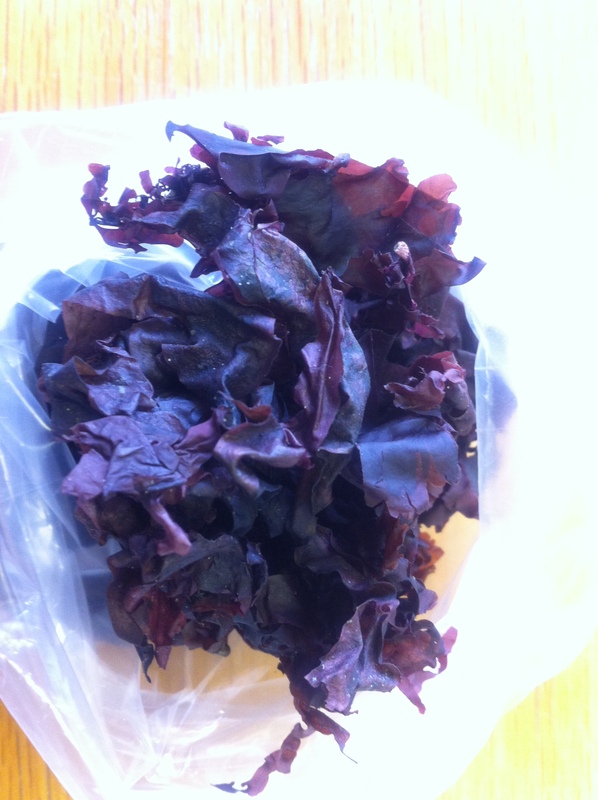 I munched my way through half a bag of dulse during the day – that’s a local dried seaweed, which is full of mineral goodness but only about 20 calories per bag. Must get some more of this for next week. I defrosted a portion of my chicky-leeky soup as a quick meal before I went out. On Tuesday, even though it was a normal day, I tried one of the Hairy Dieters recipes – the parma wrapped cod on roast veg. Husband thought it delicious and he’s keen to try other recipes from the book. It seems to be a great source of ideas when sharing meals with family. 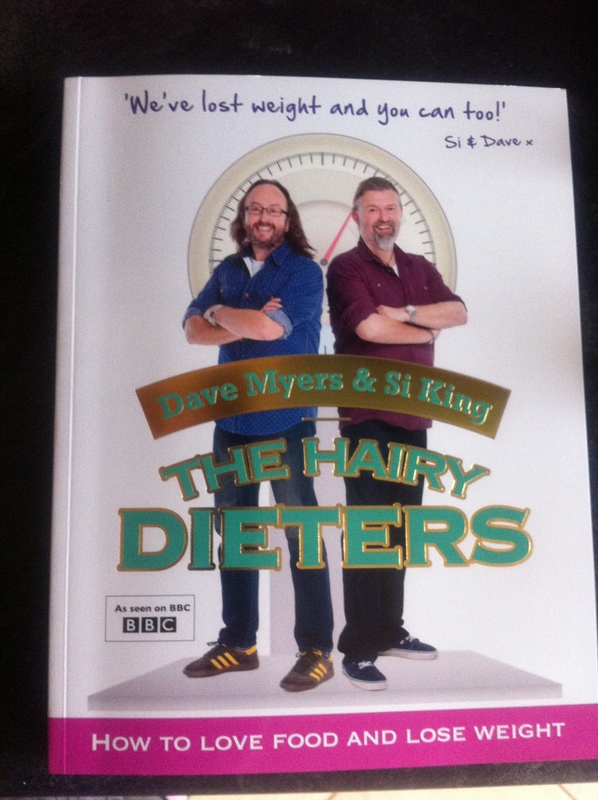 We went to see the guys at their stage show on Sunday, so I’d bought a signed copy of the book there. Thursday I took a different approach – I knew I’d be having a sandwich lunch through work, so I made myself a typical under 100 cal breakfast, and was amazed that I had a choice of several meals in mind for under 100 cals for dinner. I could have made a big fruit salad with melon, blueberries, grapefruit and pears. I could have used those zero noodles and done a tomato based sauce to go with. I had an aubergine which I could have turned into a sort of dip to eat with celery sticks. In the end, I went to the gym first, ran for 30 minutes without any problems, and wasn’t that hungry when I got home at 8. 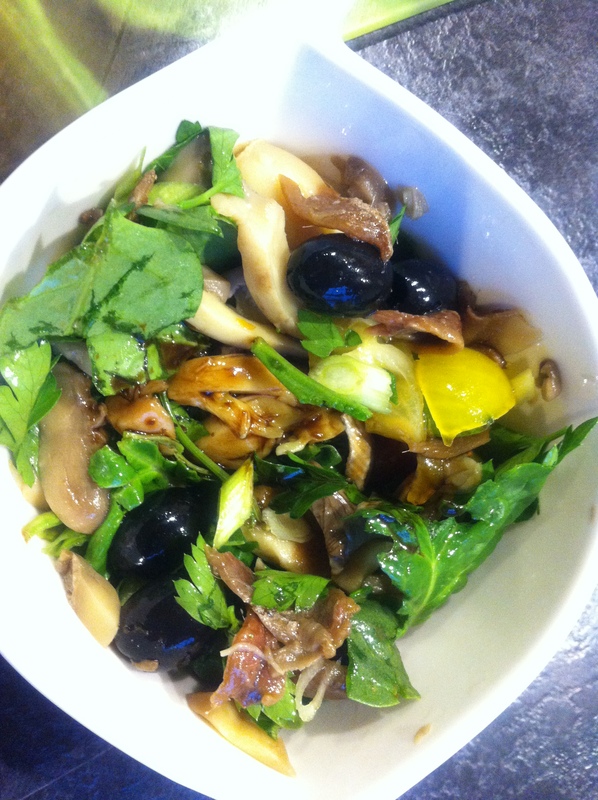 I made a small salad with half a tin of mushrooms, spinach leaves, 2 anchovies, 5 black olives and a splash of balsamic. Finished off the evening with 2 strawberries and an options hot chocolate, feeling really upbeat and positive. I might use this approach again in future, though it doesn’t get the “fasting” benefits. At the weekend I experimented with a low cal dessert recipe that was in the grauniad – lavender and banana ice-cream in parsnip tuile baskets. I had to hunt for lavender, but I got it in Sawers delicatessen eventually. As my daughter would comment “Mum, you always order the most random thing on the menu!” The ice cream bit was lovely – I always stick my over-ripe banananananas in the freezer, and they’re very easy to squish out of their skins and mix with a flavouring. I’ll definitely be doing more of that. 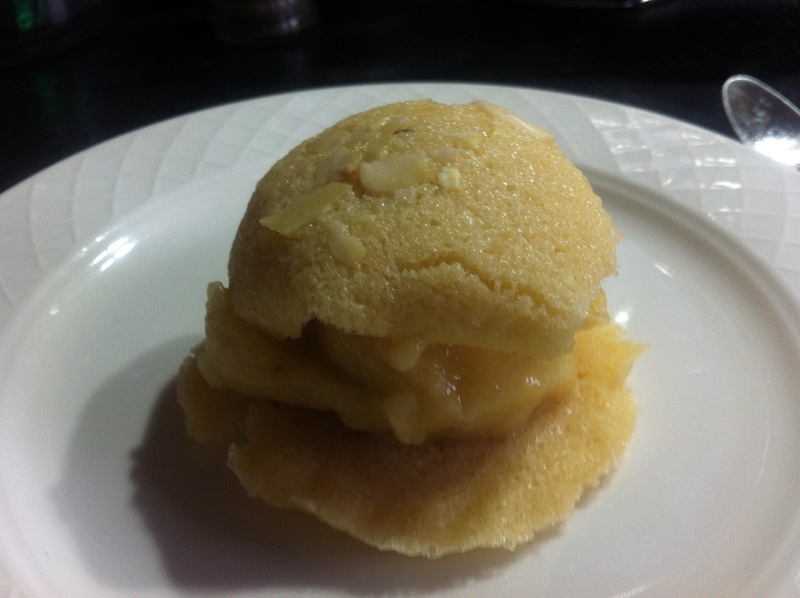 But I didn’t get the tuile biscuits right, maybe the oven wasn’t hot enough. And since husband couldn’t believe that their were pies in the book, I made the Hairy Dieter’s chicken and ham tangle pie for Saturday dinner. 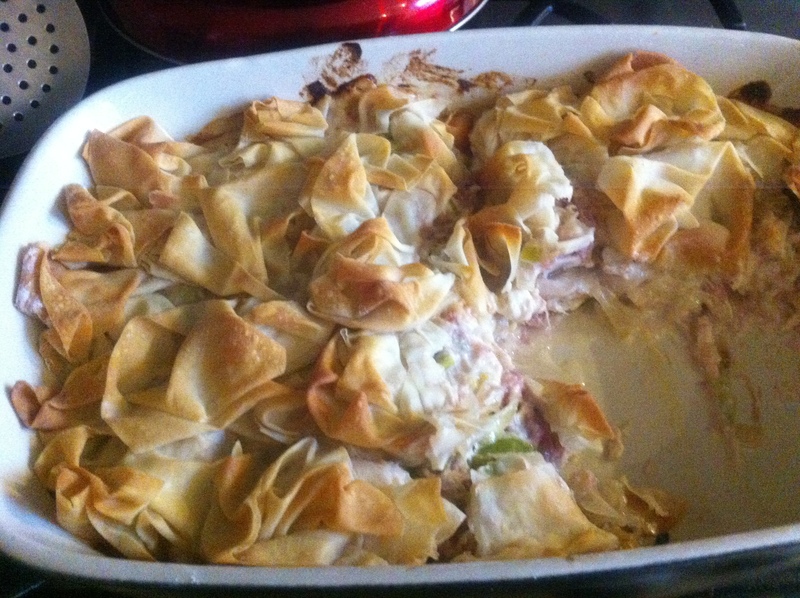 This was very tasty – full of flavoursome chunks of chicken, and I used a pack of ham hock from Sainsburys as the ham element. I’m now poring over the mouthwatering photographs wondering which to try next! That pie looks lovely! So the book is worth a look then?! Many on the various 5and2 forums are raving about this book – it’s handy to have if you share your fast meals with others, though I’m usually only cooking for one or 2, so I need to cut down the quantities, or have leftovers.